Seriously! Seriously! Seriously! | Spaceship! Spaceship! Spaceship! S.H.I.P. – Seriously Huge Investment in Parts – A LEGO spaceship model of over 100 studs in length (80cm). 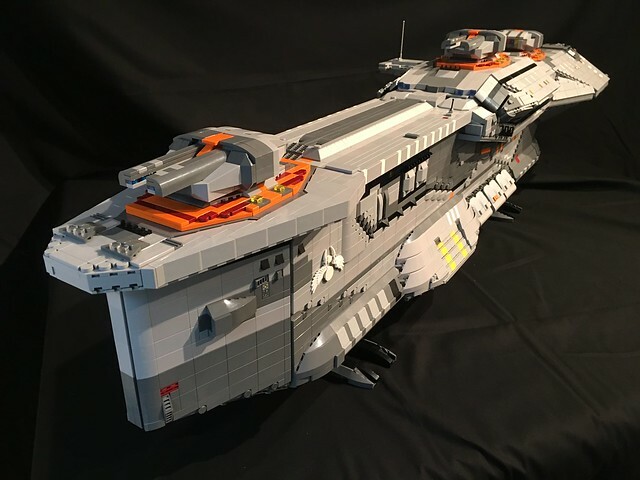 This massive Hiigaran Destroyer by Aaron Fiskum certainly qualifies both on the size criteria and what must be a ton of LEGO elements contained therein. It’s a nice model too, with some great shaping to recreate the original model seen in the Homeworld game and a ton of greebly goodies. The colour scheme is well thought out too, with Light and Dark Grey used throughout and just enough splashes of orange that it doesn’t feel like a big grey brick. To my considerably surprise this is the first SHIP we’ve covered and I shall try to dig up a few more in the next few weeks. With only 3 months until the annual SHIP building extravaganza SHIPtember I suspect many builders and hoarding parts in anticipation. This entry was tagged Homeworld, MOC, SHIP. Bookmark the permalink.